There is now considerable evidence for the involvement of K+ channels in nitric oxide (NO) induced relaxation of smooth muscles including the myometrium. In order to assess whether apamin-sensitive K+ channels play a role in NO – induced relaxation of the human uterus, we have studied the effect of specific blockers of these channels on the relaxation of myometrium from non-pregnant women. In vitro isometric contractions were recorded in uterine tissues from non-pregnant premenopausal women who had undergone hysterectomy. Apamin (10 nM) and scyllatoxin (10 nM) did not alter spontaneous myometrial contractions. However, 15-min pretreatment of the myometrium strips with apamin completely inhibited relaxation caused by diethylamine-nitric oxide (DEA/NO). The pretreatment with scyllatoxin significantly reduced (about 2.6 times) maximum relaxation of the strips induced by DEA/NO (p < 0.05). These results strongly suggest that, beside Ca2+ and voltage dependent charybdotoxin-sensitive (CTX-sensitive) K+ channels, apamin-sensitive K+ channels are also present in the human non-pregnant myometrium. These channels offer an additional target in the development of new tocolytic agents. Nitric oxide has been shown to be a potent inhibitor of spontaneous contractile activity of the myometrium from non-pregnant women. It has recently been shown that contrary to the finding in some smooth muscle, in the myometrium from non-pregnant women, there was no causal relationship between the relaxation induced by NO donors and the elevated production of cGMP [1, 2]. A number of recent studies on both vascular and uterine smooth muscle have provided evidence for the involvement of potassium (K+) channels in relaxation induced by nitric oxide (NO) donors [3–8]. In smooth muscle, K+ channels play an important role in regulation of cell membrane excitability and contractile activity of the tissue [3–8]. K+ channels consist of a diverse group of proteins with disparate structural features and controlling mechanisms. Calcium (Ca2+)-dependent K+ channels have been found in many smooth muscles including myometrium from different species [4, 9–12]. Ca2+-activated K+ channels up to now identified in human myometrium represent the type of large-conductance and voltage-dependent channels (BK) blocked by charybdotoxin (CTX) and iberiotoxin [11, 13]. However, other classes of Ca2+-activated K+ channels may exist in smooth muscle cells including K+ channels with intermediate (IK) and small unitary conductance (SK) [14, 15]. Ca2+-activated K+ channels with small conductance found in different visceral smooth muscles [4, 16, 17] have so far not been identified in human myometrium. These channels, so called apamin-sensitive K+ channels are specifically blocked by a bee venom toxin, apamin [18, 19] and scyllatoxin (leiurotoxin I), a toxin from the venom of the scorpion Leiurus quinquestriatus Hebraeus [20, 21]. Calcium-dependent apamin-sensitive SK channels and CTX-sensitive BK channels can apparently co-exist in the same cell [18, 22]. Recently, it has been demonstrated that the intermediate conductance K+ channels, sensitive to both apamin and charybdotoxin exist in mouse intestinal smooth muscles and rat renal arterioles [14, 15]. Although, inhibition of smooth muscle contraction by K+ channels openers is a well-recognized mechanism, information on the expression and characteristics of various channels is needed to develop tissue and channel type specific K+ channel openers. In order to assess whether apamin-sensitive K+ channels play any role in NO induced relaxation, we have in this study examined the effect of specific blockers of these channels on the relaxation of myometrium from non-pregnant women. Human uterine tissues were collected from 14 non-pregnant premenopausal women (age, 41–50 years; median, 46 years) who had undergone hysterectomy because of either dysfunctional bleeding, benign uterine tumors or cervical malignancy. All women were recruited from patients of the Department of Gynecology, Medical Academy of Bialystok, Poland. The women were informed about the nature and procedure of the study and gave their written consent. The local ethics committee approved the study. Myometrial samples were excised transversally from the fundus of uterus, placed in an ice-cold physiological salt solution and immediately transferred to the laboratory where processed as previously described . Briefly, 4–8 strips, 6–7 mm in length and 2 × 2 mm of cross section area were obtained under a dissecting microscope. The strips were then mounted in an organ bath containing 20 ml of physiological salt solution (PSS) at 37°C, pH 7.4 and bubbled with carbogen (95% O2 + 5% CO2). Strips were left for the equilibration period of 1–2 hours. During that period the passive tension was adjusted to 3 mN. Activity of myometrium was recorded under isometric conditions by means of force transducers with digital output. The spontaneous contractile activity was treated as a control. After the recording of spontaneous activity the response of myometrium to nitric oxide and K+ channel blockers was recorded. Quantification of the responses was done by calculation of area under the curve (AUC), amplitude and frequency of contractions. The area was measured from the basal tension over a 10-min period after each stimulus. The effects were evaluated by comparing experimental responses with the controls (set as 100%). Diethylamine-nitric oxide (DEA/NO), which has been shown previously to inhibit spontaneous activity in human [2, 24] or rat  myometrium, in a concentration-dependent manner, was used as NO donor. Three or four strips from the same uterus were studied in parallel. One of them was always treated as a control and regularly washed with PSS. DEA/NO was given cumulatively directly into the organ bath in log increments within the concentrations range 10 nM to 100 μM. The effect of DEA/NO was observed in the absence and after 15 minutes preincubation with 100 nM CTX, 10 nM apamin or 10 nM scyllatoxin. The contact time for each concentration was 10 min. Only one concentration-response curve was obtained for each strip. DEA/NO, a generous gift of dr Larry K. Keefer from Laboratory of Comparative Carcinogenesis, National Cancer Institute, Frederick, Maryland, USA, was dissolved in a 10 mM NaOH, and kept cold until dilution with cold pH 7.4 buffer immediately before addition to a bathing medium . The concentration of NaOH in the organ bath never exceeded 0.001% v/v and had no influence on the experimental responses. Apamin and scyllatoxin, purchased from Sigma Chemical Company, were dissolved in distilled water. All substances were added directly to the organ bath containing physiological salt solution composed of (mM): NaCl 136.9; KCl 2.68; MgCl2 1.05; NaH2PO4 1.33; CaCl2 1.80; NaHCO3 25.0; glucose 5.55. All data were analyzed statistically with PRISM 3.0 (GraphPad Software Inc., San Diego, Calif.). The data were analyzed with ANOVA, Friedman test or Wilcoxon matched pairs signed rank test, where appropriate. The statistical significance was considered when probability value was P < 0.05. Throughout the paper the results are expressed as mean ± S.E.M. and n denotes the number of tissues obtained from different patients. In the case when the same protocol was run on two strips from the same uterus, the data were averaged. All experiments were performed on myometrial strips exhibiting regular, spontaneous contractile activity after equilibration (Fig. 1A). The mean frequency of contractions was 3.95 ± 0.3 per 10 min and its mean amplitude was 6,06 ± 0.46 mN (n = 24). Cumulative administration of DEA/NO (10 nM – 100 μM) caused an inhibition of the spontaneous activity in a concentration – dependent manner (Fig. 2). The mean AUC calculated for the highest concentration of DEA/NO was (51.95 ± 4.68)% of control. The effect was seen as a decrease of amplitude of contractions and a gradual reduction of its frequency (Fig. 1B). Both effects were statistically significant (Friedman test). Removing of DEA/NO from the bathing medium by washing with the PSS (two times in 15 min interval) caused gradual return of the contractile activity (Fig. 3). Charybdotoxin (100 nM), a blocker of Ca2+-sensitive potassium channels with large conductance caused no change of amplitude, and frequency of the spontaneous contractions (Wilcoxon matched pairs rank test) (Fig. 4). However, 15 min pre-treatment of the strips with 100 nM CTX completely inhibited the DEA/NO induced decrease of AUC and amplitude of contractions (n = 10) (Fig. 2B and 5). In the presence of CTX, a small but nevertheless statistically significant decrease of the frequency was observed for the highest concentration of DEA/NO (100 μM). 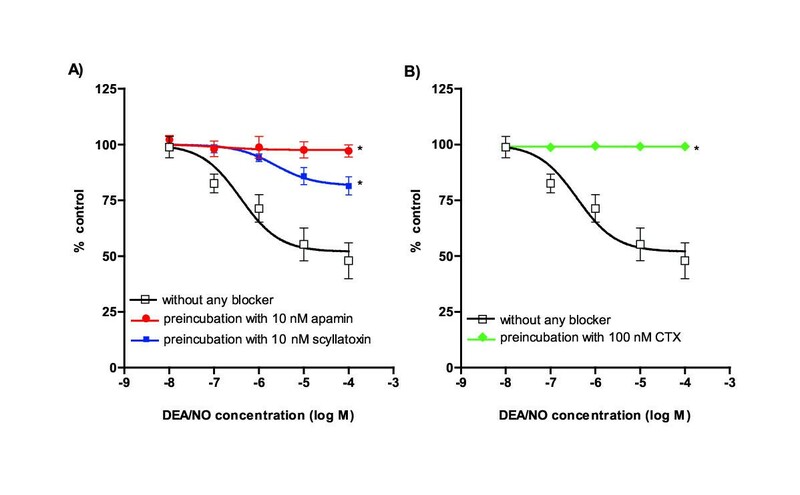 Concentration – response relationships of DEA/NO-induced relaxation before and after pretreatment with blockers of Ca2+-sensitive K+ channels: (A) DEA/NO alone (n = 10), DEA/NO after preincubation with 10 nM scyllatoxin (n = 5), or 10 nM apamin (n = 10); (B) DEA/NO in the absence and presence of 100 nM CTX (n = 10). Each point represents the mean ± SEM and * indicates effects significantly different from those observed in absence of the blockers (ANOVA). The spontaneous contractile activity was treated as a control. Original recording showing effects of DEA/NO on spontaneous contractions of the myometrium from non-pregnant women followed by reappearing of the contractile activity after wash-out with the PSS solution. Effects of Ca2+-sensitive K+ channel blockers on amplitude and frequency of spontaneous contractions. Each bar represents the mean ± SEM of 10 (apamin), 5 (scyllatoxin), and 10 (CTX) experiments. 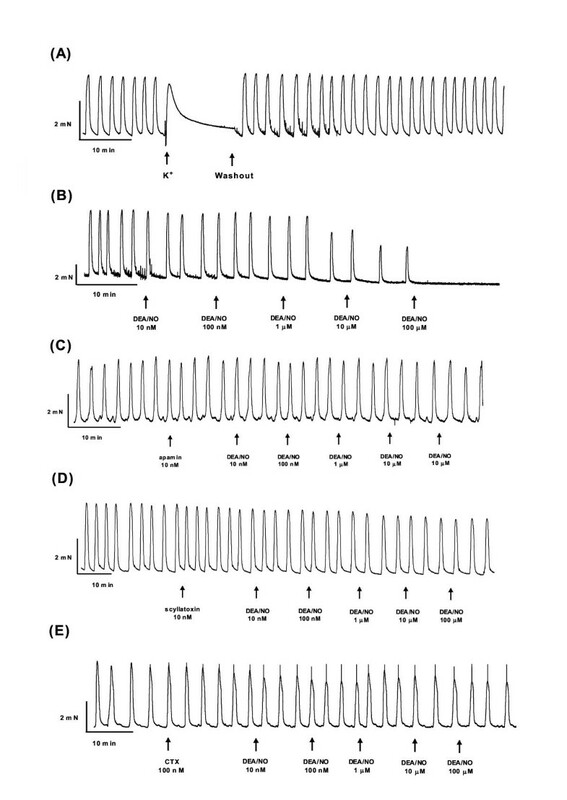 In experiments performed on tissues taken from 10 women, we studied the effect of apamin, a blocker of Ca2+-dependent K+ channels with small conductance on DEA/NO – induced relaxation of the myometrium. Apamin at a concentration of 10 nM did not alter spontaneous myometrial contractions. In presence of apamin, the mean values of amplitude and frequency of contractions did not differ significantly from those observed before the blocker administration (Wilcoxon matched pairs rank test) (Fig. 4). However, pretreatment of myometrium strips with 10 nM apamin for 15 minutes resulted in complete inhibition of relaxation caused by a cumulative administration of DEA/NO. In the presence of apamin, the mean AUC value at the highest DEA/NO concentration in the bath medium was (97.13 ± 2.73)%. This value did not differ significantly from that calculated for the spontaneous contractions (p > 0.05) (Fig. 1C, 2A and 5). To test this effect we used scyllatoxin, a polypeptide isolated from scorpion venom, that blocks the apamin-sensitive K+ channels in other tissues [20, 21]. 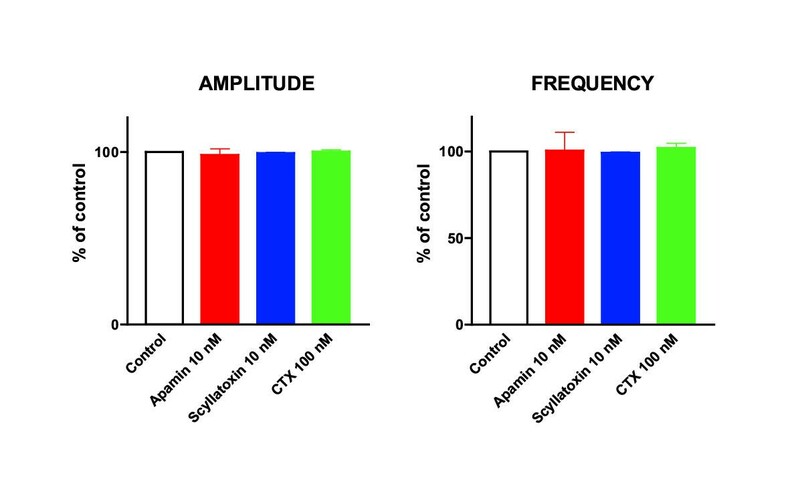 In a separate group of five experiments, scyllatoxin (10 nM), like apamin, did not alter spontaneous myometrial activity (Fig. 4). However, pretreatment of tissue with 10 nM scyllatoxin considerably reduced the DEA/NO-induced relaxation of the strips (Fig. 2A and 5). In the presence of 10 nM scyllatoxin, the mean AUC value at 100 μDEA/NO in the bath medium was (81.63 ± 2.54)%. Thus, in presence of 10 nM scyllatoxin, the maximum of DEA/NO-induced relaxation of the myometrium strips was about 2.6 times smaller than that recorded in the absence of the blocker. The difference was statistically significant (P < 0.05). However, the reduction of the DEA/NO-induced relaxing effect by scyllatoxin was, lower than that observed after pretreatment with apamin After pretreatment with 10 nM scyllatoxin the AUC value calculated for 100 μM DEA/NO (81.63 ± 2.54%) significantly differed from that calculated in presence of 10 nM apamin (97.13 ± 2.73%). The present data show that DEA/NO causes concentration-dependent decrease of AUC, amplitude and frequency of the myometrium from non-pregnant women. The blockers of both SK and BK channels reduce the DEA/NO-induced inhibition of spontaneous activity of the myometrium. Relaxation of many smooth muscles by NO donors involves activation of K+ current resulting in hyperpolarisation of cell membrane. K+ channels may be activated by pathways involving direct action by NO and/or cGMP-mediated mechanisms [26, 27]. In majority of smooth muscles, the relaxing effect of NO is related to opening of large-conductance Ca2+ and voltage dependent K+ channels blocked by charybdotoxin and iberiotoxin (BK). Present data show that, in the myometrium from non-pregnant women, the relaxation of spontaneous contractions induced by DEA/NO is inhibited by charybdotoxin. The same effect has been observed before . Thorough analysis revealed, however, that although CTX completely inhibited the DEA/NO-induced decrease of amplitude it was less efficient in preventing the lowering of frequency. Using contraction as the only indicator of the DEA/NO influence on the myometrium activity, we can only speculate about a mechanism of the observed effect. The concentration of CTX used in the experiments inhibits about 80% of potassium current through BK channels . That means that a fraction of this channels could remain unblocked, accessible to NO donated by DEA/NO. The fact that only the frequency of contractions is sensitive to activation of this fraction may indicate that, in presence of 100 nM CTX, other types of K+ channels play predominant role in controlling the amplitude of contractions. It also implies that NO donated by DEA/NO inhibits the spontaneous contractile activity reducing excitability of the myometrium cells by taking their membrane potential away from the threshold for action potential generation. Our data indicate that also apamin and scyllatoxin, blockers of small conductance K+ channels can counteract DEA/NO-induced relaxation. Apamin is a blocker of Ca2+ sensitive K+ channels with small conductance . In different smooth muscles the maximum effective concentrations of apamin are within the range 1 nM to 1 μM [14, 29, 30]. The lack of NO-induced inhibition of contractile activity that we observed in the presence of 10 nM apamin suggests the existence of apamin-sensitive K+ channels in cell membrane of the myometrium from non-pregnant women. On the other hand, in some smooth muscle preparations from animals intermediate conductance K+ channels exist that are sensitive to both CTX and apamin [14, 15]. The similar effects of CTX and apamin on the relaxation caused by DEA/NO suggest that the same channel may be a target for both blockers. Such a conclusion, however, is inconsistent with data obtained in presence of scyllatoxin, a blocker of Ca2+-activated K+ channels with small conductance  that has no effect on intermediate or large conductance, Ca2+-activated K+ channels . The decrease of NO-induced inhibition in presence of scyllatoxin shown here supports the suggestion that Ca2+-activated K+ channels with small conductance exist in the myometrium from non-pregnant women. The difference between effects of equimolar concentrations of apamin and scyllatoxin is in agreement with the fact that the scyllatoxin affinity to the SK channels is 10 – 20 lower than that of apamin [30, 32]. Our findings, however, are not in agreement with the data reported by others. Perez et al. using cell membranes from myometrium from non-pregnant women that were incorporated into lipid bilayer have founded no apamin-sensitive K+ currents in this preparation. The lack of sensitivity to apamin was also observed in a beta-subunit of maxi KCa channel from human myometrium expressed in Xenopus laevis oocytes . The discrepancy between our findings and the electrophysiological observations [11, 33] may be explained by assuming that exposure to NO or metabolic activation is required to activate the apamin-sensitive K+ channels. It has been observed that the transfer of ionic channels to the artificial environment resulted in an inactivation of these channels [34, 35]. The data of the present study strongly suggest that, the apamin-sensitive K+ channels exist in the myometrium from non-pregnant women. On the basis of our data we cannot, however, preclude that in myometrium from non-pregnant women exist channels sensitive to both CTX and apamin similar to those reported in some smooth muscles [14, 15]. Further studies are necessary to verify this hypothesis. We have previously shown that K+ATP channel openers are potent inhibitors of contractile responses of the myometrium of non-pregnant women induced by vasopressin, an agent implicated in the pathophysiology of dysmenorrhoea . Specific openers of apamin sensitive K+ channels, if developed, should have strong potential in the treatment of dysmenorrhoea.